It is going to be another long day of writing. 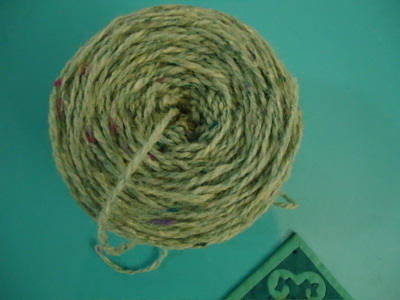 But I made good progress yesterday on my revisions, and last night I rewarded myself with sushi and yarn-winding. This entry was posted in grad school, knitting and tagged grad school, knitting, peace fleece, savethewords, shawl, terra, writing by barefootrooster. Bookmark the permalink. So pretty! I’m spending today writing, too. So hard not to cast on and join in! Love the green! And the tweedy flecks in it, too. Have fun knitting! Pretty colors! Terra looks like a cozy wrap, and a fun knit. Love the Adopt-a-word site… I read quite a few, but haven’t found one to adopt… yet. I love that color! Isn’t Terra mesmerizing to knit? It’s one of the most relaxing patterns I’ve come across. Even the lace section is pretty with minimum effort. So perfect. I adopted tristifical. Seemed about right. Hi, this is my first visit here and couldn’t help but to leave a comment. I finally taught myself how to knit a couple days ago. I only know the knit and purl stitch so far and have almost finished a very imperfect basic garter stitch scarf for my 6 year old. Anyway, I loved that save the word site. Thanks for sharing it. I can’t seem to find those definitions on dictionary.com though so I have no idea what you did with your coffee mug. I guess these words truly do need some saving. 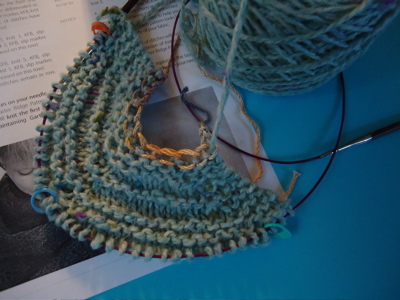 Mmmm….squishy yarn! Squishy garter stitch! Yummy. I adopted aquabib, but haven’t been very good about using it. I thought it was perfect for me (I do drink quite a lot of water, especially these days), but the topic of my water-drinking does not come up as often as one might expect.